Anthropogenic CO2 emission increase has very likely been overestimated for China for the period of 2003-2007, having large implications on the estimated CO2 sink increase over East Asia (China, Japan, Korea and Mongolia) during the period of 2002-2012, according to a new study by Dr. Prabir K Patra at the Department of Environmental Geochemical Cycle Research, Japan Agency for Marine-Earth Science and Technology (JAMSTEC: Asahiko Taira, President), with Dr. Tazu Saeki at the Center for Global Environmental Research, National Institute for Environmental Studies (Chiho Watanabe, President). Based on high-precision measurements of atmospheric concentration and an atmospheric chemistry-transport model*1, they estimated surface sources and sinks of CO2 and CH4, the two most significant greenhouse gases*2. Distinction between CO2 sources and sinks at regional scales is important for future predictions of atmospheric concentration and global warming as well as for greenhouse gases emission management. Presently, the sources and sinks on the Earth’s surface are calculated by country-level statistics (bottom-up modeling; Fig. 1), which are then refined with the analysis of atmospheric concentrations (top-down modeling). High bias in bottom-up anthropogenic CO2 emissions results in larger land CO2 sink estimates because the top-down models constrain total CO2 flux by the atmospheric CO2 growth rate. In addition, the scientist's independent results from methane (CH4) inversion (as reported in press release on February 01, 2016) supported lowering the East Asian CH4 emission increase rate by 41% during the period of 2002-2012 (Fig. 2). Long-term aircraft measurements of CH4 over Sendai carried out by Tohoku University have provided a key verification on the rate of CH4 emission increase from the East Asia region. By applying a scaling factor of 0.59, based on CH4 inversion (Fig. 2), to the rate of bottom-up anthropogenic CO2 emission growth rate for China (1.7 petagram of Carbon over a period of 2002-2012), they find no systematic increase in land CO2 uptake over East Asia during 1993-2010 or 2000-2009 (Fig. 3). The result of no significant change of East Asian CO2 sink is in better agreement with the terrestrial biospheric model simulations that include CO2-fertlization and climate effect, and bottom-up estimation from the country reporting to the Food and Agriculture Organization (FAO) between the 1990s and 2000s (Fig. 3). These results have large implications for greenhouse gas management as per the Intended Nationally Determined Contributions (INDCs) under the Paris Agreement, contributing to the efforts for reduction of greenhouse gas emissions and how the terrestrial ecosystems models are tuned for climate prediction studies. This study has been carried out as a part of the Environment Research and Technology Development Fund (Research Number: 2-1401) by Ministry of the Environment, Japan. The above results were published on the Geoscience Letters, the official journal of the Asia Oceania Geosciences Society on May 16, 2017 (JST). *1 Atmospheric Chemistry Transport Model (ACTM): Numerical simulations are performed using ACTMs to calculate spatial distributions and time evolution of chemical species in the atmosphere using large-scale super computers. The JAMSTEC’s ACTM is based on the CCSR/NIES/FRCGC atmospheric general circulation model (AGCM). It is also used for top-down modeling of emission refinements using atmospheric concentration observations. *2　Greenhouse gases (GHGs): Carbon dioxide (CO2) and methane (CH4) are the two most prevalent anthropogenically produced greenhouse gases. Both are colorless and odorless, exerting about 73% and 42% of the total anthropogenic radiative forcing (RF), respectively, over the period of 1750-2011. According to the IPCC 5th Assessment Report, emissions of CO2 and CH4 together contribute 78% of the total RF increase due to the GHGs alone since the preindustrial era. By sending the Earth’s outgoing infra-red radiation back to the surface, GHGs trap heat in the atmosphere, which is measured by RF that is integrated since the pre-industrial reference period of 1750. * In our model, methane lifetime has been estimated to be 10 years (calculated based on atmospheric mass). Figure 1. World energy production is the single largest source of the major greenhouse gases and air pollution precursors. Increase in emissions of both CO2 and CH4 are linked to the Chinese coal industry; while CH4 is emitted during the coal mining (right column), emissions of CO2 occur during the consumption of coal primarily in power plants and industrial combustions (left column). The CO2 and CH4 emissions for the major anthropogenic sectors are taken from the Emissions Database for Global Atmospheric Research (EDGAR; http://edgar.jrc.ec.europa.eu/overview.php?v=42FT2010). Because both CO2 and CH4 emissions are tightly linked through the coal industry within China, their emission factors and production/consumption statistics are lesser known to the international emission inventory community (e.g., EDGAR). This situation could have led to an estimation of emission increase rate as high as 20% during 2003-2005. The high emission increase rate and its uncertainty are problematic for the CO2 inverse modelling studies in particular, because the anthropogenic emissions are taken as truth for deriving land (residual) biospheric flux using atmospheric transport model and CO2 concentration data. Figure 2. (a) Comparisons of CH4 inversion results (black: a priori; blue: a posteriori) for the East Asia (EA) region with the EDGAR estimated anthropogenic emissions for China. The linear fits to the annual mean values are shown as lines, with slopes being marked along the fitted lines. (b) Linear relationship of anthropogenic CO2 and CH4 emissions for China over the period of 1970-2012 is evident in the emission inventories, e.g., EDGAR42FT. The inter-decadal values are marked by text and red circles. Since the fugitive CH4 emissions from coal mining are tightly linked with CO2 emissions from use of coal in power plants and other industrial combustions, the anthropogenic emissions of both CO2 and CH4 increase in concert. Figure 3. 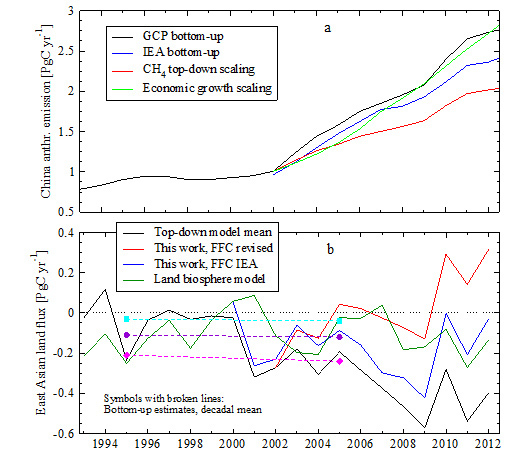 Effect of FFC CO2 emission increase rate on regional carbon budget of East Asia. (a) Time series of anthropogenic CO2 emission scenarios for China for 4 scenarios based on a scaling factor from CH4 inversion results for East Asia, the economic (GDP) growth, and those estimated by CDIAC and IEA emission inventories. Apparently the fastest CO2 and CH4 emission during 2003-2005 in the inventory databases, e.g., EDGAR, is caused mainly by an increased in emission intensity (emissions per unit of GDP) from 200 to 250 in the period 2001-2005. Thus the declared reduction in emissions per unit of GDP by 33.8% over the period of 2005-2014 at the 21st Conference of Parties (COP21) is not free of uncertainties. (b) Multi-model ensemble mean CO2 flux of East Asia by top-down method is corrected a posteriori for revised anthropogenic CO2 emissions from China (as in panel a). The mean CO2 exchange simulated by TRENDY global dynamic vegetation models are also shown, confirming no significant increase in carbon uptake in East Asia due to CO2 fertilization and climate (S2 simulation; green line). The forest carbon storage rates based on the country statistics of Land use and land cover to the the U.N. Food and Agriculture Organization - Forest Resource Assessment (FAO-FRA2015; country-level inventory estimates) also suggest no signifcant change in carbon sequestraion in the East Asia region (symbols; different colours are for different data sources).